According to preliminary estimates, Canada’s population was estimated at 36,048,500 on January 1, 2016, up 62,800 from October 1, 2015. 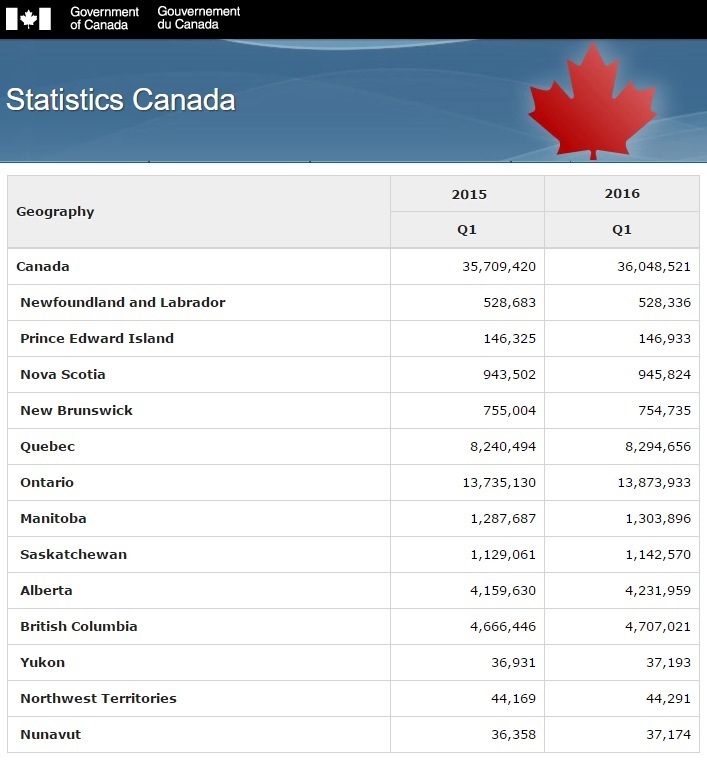 In the fourth quarter, Canada’s population growth rate was 0.17%, twice the rate observed for the same quarter in 2014 (+0.08%). Over the last year, population growth slowed slightly from 1.04% in 2014 to 0.95% in 2015. This slowdown was much greater in Alberta (from +2.38% to +1.72%), Yukon (from +1.78% to +0.71%) and the Northwest Territories (from +0.70% to +0.28%). In the fourth quarter, natural increase was 27,400 (the difference between 95,300 births and 67,900 deaths), based on preliminary estimates. During the same period, net international migration was 35,400, up 600 from the same quarter in 2014, which had recorded the lowest level for a fourth quarter since 1971.